The Iranian Students' News Agency reported, citing Navy Commander Rear Admiral Hossein Khanzadi, that Iran has deployed 58 fleets to the northern Indian Ocean and the Gulf of Aden, situated just outside of the Persian Gulf — the source to a major part of the world's oil exports. In an address to the people of Semnan Province on 4 December, Iranian President Hassan Rouhani reiterated threats to prevent all oil exports from the Persian Gulf in the event the US curbs Tehran's own exports. "If someday, the United States decides to block Iran's oil [exports], no oil will be exported from the Persian Gulf," Rouhani said. The Iranian president also vowed that ultimately the US won't be able to halt Tehran's oil trade and promised that the country will emerge victorious from the confrontation with Washington. Relations between the US and Iran took a nosedive after US President Trump announced the country would be exiting the Iranian nuclear deal and re-imposing sanctions against Tehran's energy and banking sectors. In return, the Islamic Revolutionary Guard Corps and other Iranian officials warned the US against attempting to curb Tehran's oil trade, promising to block the Strait of Hormuz, the only exit from the Persian Gulf — one of the key sources of oil exports in the world. In December, the US announced it would be sending an aircraft carrier strike group to the Persian Gulf in the near future after a decades-long absence of the US fleet in the region. 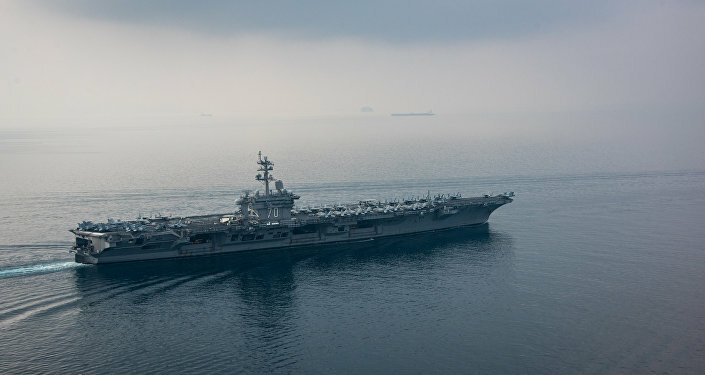 The group is expected to maintain a presence in the region for around two months to "provide deterrence" against any potentially hostile Iranian activity in the waters, an unnamed official told The Wall Street Journal.